Similar Movies: Three on a Match, The Purchase Price, Female, Baby Face, Illicit, Ladies They Talk About, A Free Soul, The Divorcee, Red-Headed Woman, The Miracle Woman, Gambling Lady, So Big! Least Likeable Character Joan Blondell Ever Played on Film? I don't understand why they were starving the children? 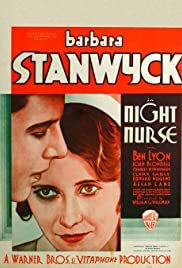 Night Nurse is my favorite Barbara Stanwyck movie! Am I the only one? What does Ben Lyon say in the VERY last seconds???? certainly was pre-code wasnt it? ?